The scarlet Malachite Beetle Malachius aeneus is one of Britain’s rarest insects which has been recorded in Essex since 1839. In recent years the species has undergone a considerable range contraction and has been listed on the UK Biodiversity Action Plan (UKBAP). It had been known from only 8 locations in the UK, but several new sites were identified in 2006. Scarlet Malachite Beetle has a long historical association with Essex and there are records in the County dating back to 1839. Modern populations occur on several village greens and surrounding meadows on the Essex/Hertfordshire border. In most cases, beetles have been discovered pollinating near thatched houses on unspectacular grassy areas with an abundance of meadow foxtail and buttercup. Malachius aeneus has a very brief flight season approximating to a single month at the main Essex colony (from mid-May to mid-June). Many sightings reported by non-specialists centre upon cases of mistaken identity (generally confusion with the equally scarlet Lily Beetle Lilioceris lilii) and should be subjected to a certain degree of scrutiny. However four reports in 2006 seem likely to be genuine records for the species (Coleman, 2006). 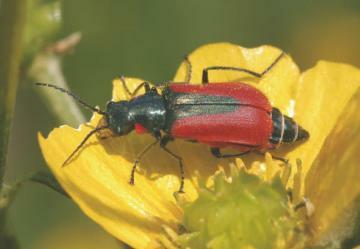 If you think you have seen this beetle, if at all possible please submit a photograph with your record. Please don't confuse this beetle with other red beetles such as the Lily Beetle, Cardinal Beetle or other malachite beetle species. Note the shape and the dark marking down the centre of the abdomen. Also note that the Scarlet Malachite Beetle appears only for three weeks during May and June.